IDeATe is Integrative Design, Arts, and Technology study that is open to all Carnegie Mellon students to give them an opportunity to expand their studies in interdisciplinary ways in order to enhance their primary majors. 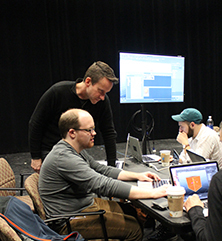 The IDeATe concentrations and minors connect students and faculty from across the university through coursework and collaborative studio experiences. Students can participate in IDeATe in two ways, either through a concentration or by declaring a minor. 1. Concentration: Students can elect to take a few courses. A concentration is a total of four courses (portal course + three courses in an IDeATe area). 2. Minor: A total of five courses (portal course + four courses in an IDeATe area). English majors who are minoring or pursuing a concentration in the IDeATe content areas will first take a portal course in the fall of their sophomore or junior year, which will sharpen the skills they will need to work with students from other disciplines. Note: it may be the case that the portal course will also count for a Gen Ed requirement. This has yet to be determined. Interested students should first meet with their primary English major advisor to determine if an IDeATe concentration or minor is right for them. Students will then work with both their primary advisor and the IDeATe advisor, Kelly Delaney, to monitor their progress. If you are an English major interested in pursuing a concentration or minoring in IDeATe, contact Kelly Delaney. For more information, please visit the IDeATe website.